Crystal River, Fla. – Sept. 13, 2015 – Save Crystal River (SCR) is poised to take the first step in an historic project to remove noxious algae from Kings Bay and restore the waterway’s natural habitat. The event is historic because it is the first time a non-profit group, or any private sector group for that matter, has gotten the go-ahead plus major funding from the state, in this case $1.6 million, for a plan to begin restoration of the imperiled waters. SCR, a small group of residents and business people, is confident the pilot project can show how the bay can be reclaimed after being held hostage for over a decade by the invasive algae Lyngbya. Gator Dredging of Clearwater has its permits and next week is scheduled to begin applying its unique removal process of the algae and dead organic material from two canals in the northeast portion of the bay. Sea and Shoreline of Ruskin, Fla., an experienced marine restoration subcontractor, will then begin replanting native vegetation. When the pilot project is successfully completed, SCR says the next step in the plan is to present the positive results to legislators to obtain subsequent funding for other areas to restore freshwater spring flow into the many canals feeding into Kings Bay. In addition, SCR will continue to work with various government entities and agencies to facilitate the cleanup of the remaining bay waters. Gator Dredging is utilizing three crucial weapons in the project. The first is a specialized hydraulic vacuum process to remove the Lyngbya and dead material on the bottom while leaving the existing natural sediment in place. The second element is to plant a specially developed native eel grass named “Rock Star”. The grass will be protected with special cages. Rock Star was cultivated by the University of Florida specifically for this project. The plan is to replace the Lyngbya and assist Rock Star in out-competing it. Rock Star eel grass has the ability to uptake dissolved nutrients in the water faster than the Lyngbya, enabling the growth of the eel grass to substantially exceed that of the Lyngbya. The final critical stage of the project involves maintenance and protection as specifically designed protective cages will be positioned over the newly planted grasses. The grasses will be monitored and managed to allow them to take over their area. Unlike Lyngbya, Eel grass is a natural food for manatees, ducks, turtles and many other species. 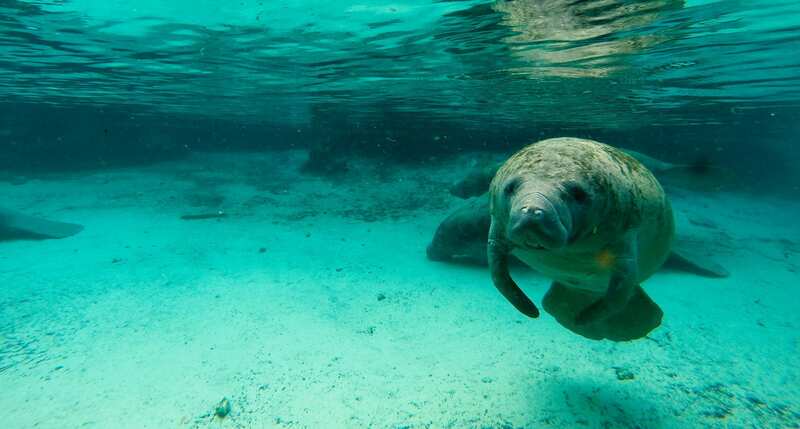 The restoration of the bay’s ecology is crucial for the future of the ever-growing manatee population that winters in the bay, according to SCR. The manatee will even be able to begin to nibble some of the grass when it grows beyond the wire of the protective cages. When the restoration is complete, all the animals will have healthy, native foods again. Dean said he thought it was one of the “best of the best” models of goal setting and cooperation he had seen between such a group and the Florida Department of Environmental Protection. He said he liked the plan because it is a simple, direct focused project to remove what’s harming the bay and begin a recovery. The project is scheduled to begin approximately Sept. 15 and will be completed by the opening of manatee season, Nov. 15. Staging the equipment will occur first on the property leased for this project at the intersection of Bayshore Dr. and NE 2nd Court in Crystal River and then operations will be set up in the adjacent residential canals. Water removed with the Lyngbya and debris will be cleaned and returned to the canals. The extracted material will be used as fertilizer in agriculture. “This is citizens working with private enterprise and government to get an important environmental project accomplished,” Moore said. “This is just the kind of public/private partnership that Governor Scott has championed,” she said and noted that Scott had specifically left the project in this year’s budget demonstrating his commitment and support of critical water projects like this one. To find out more about SCR, visit its website at www.savecrystalriver.com and also Facebook at www.facebook.com/savecrystalriver.